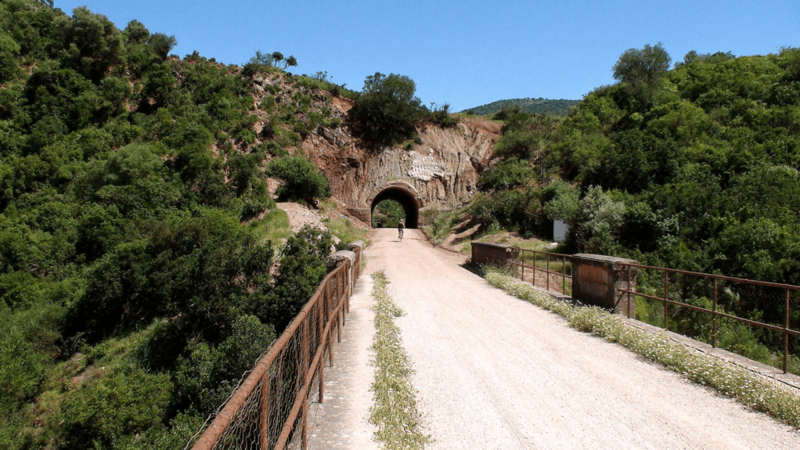 The surroundings of the Vía Verde de la Sierra make it absolutely clear that cycling here on the “green roads” is a piece of cake. Huge hills, up to 600 metres high, dominate the landscape. Towns and villages with their white-washed houses and quite often old castles, perch on the tops. In the distance the 1,700 metre foothills of even higher mountains are visible. A very diverse mountain landscape where it would normally be hard labour for hikers and cyclists. Hill up and hill down, in the burning Andalucian sun where thirty degrees Celsius is considered a civilised temperature. But now, it’s as if you are on an electric bike! Due to the slightly descending track, you swoosh effortlessly from one tunnel to the next. All the while being constantly surprised by the ever-changing surroundings and views. In general the railways were built at the beginning of the last century and were never really intended for public transport. They were mostly made to transport goods from factories or mines, or to transport soldiers. At that time they were often paid for by foreign investors, for example the French or English. After closing down the mines the railways became superfluous. Vía Verde de la Sierra was built in the late 1920s. It should have connected the cities of Jerez de la Frontera and Setenil, but it never came to that because the civil war broke out and Spain was plagued by the economic crisis. After that, nobody was interested in finishing the railway line. Here there is enough natural beauty. The presence of the river Guadalete provides lush greenery. In the early summer the roadside is full of bright yellow broom, red poppies and blue cornflowers. Butterflies and dragonflies flutter everywhere along the cycle path. Wild goats graze in the bushes and there are otters, turtles and badgers in the area. Halfway along the route you can even admire a large colony of griffon vultures, the pride of the region. At Peñon de Zaframagon, a protruding rock houses about 250 couples. A rotating camera is placed right next to the rock and at the visitors centre, located in an old station, the vultures can be watched live. There is also a small exhibition. Really worth a stop! There’s a persistent story kept alive around Olvera, a village about 100 kilometres south-east of Seville. They say that for 40 years a railway employee readied himself every day with his cap and whistle to go to work. The train never came because the track was never put into use. And yet the man, forgotten in a Spanish salary administration, received his salary for forty years. A special experience are the many tunnels on the entire route; thirty in total. The short ones are unlit, but in the longer ones, motion detection lamps are installed. The temperature in such a tunnel drops by about 10 degrees, good for cooling down on hot afternoons. We have a number of bicycles available and can take you to Olvera with the bike for a small fee. From there the route drops slightly and you end up in Puerto Serrano where you can also be picked up. However you can also choose to make the last sportive climb to the Bed and Breakfast yourself. At Coripe, the village between Olvera and Puerto Serrano, bicycles can be rented for those who don’t want to cycle 36 kilometres or want to take the children with them. For example, you can cycle up to Peñon de Zaframagon, the vulture information centre, and then back again. At the old station in Coripe you can also have a delicious lunch! An ideal place for a stop. 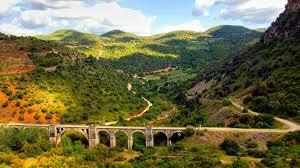 Click on the link for more information about cycling Vía Verde de la Sierra. Southern Spain is the perfect world for families with kids. The Spanish are crazy about children. For example, they love to stroke their hair and often give a gift of candy or a toy. Particularly in the non-tourist places like Puerto Serrano. As a parent walking in anywhere with your kids, you feel very welcome. Running and yelling kids in a restaurant? The Spanish people just smile! We always say: "In Catholic Spain, Dios may come first but the children are a close second."